Posted March 22, 2019, 2:06 p.m.
Posted May 9, 2016, 11:14 p.m.
Posted April 21, 2016, 4:23 p.m.
Posted March 30, 2016, 4:18 p.m.
Nearly three years after her son was shot and killed in broad daylight in a South L.A. strip mall, Lenell Ellis walked into a courtroom and prepared to hear his killer’s sentence. 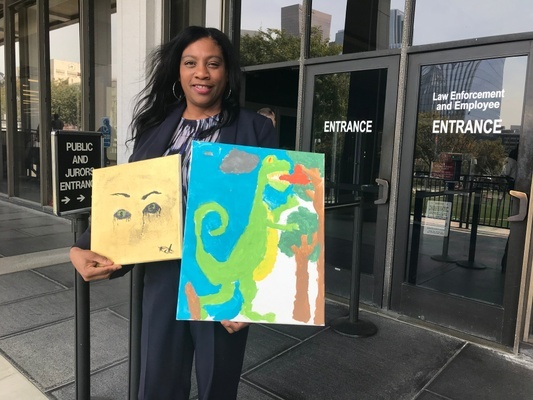 In her hands, she clutched two paintings: one brushed gold with a set of eyes in the center, and the other, a drawing of a dinosaur, a project her son, Robert Ellis worked on with his nephew. The 27-year-old never got to finish the drawing. Before Los Angeles County Superior Court Judge Richard Kemalyan handed down Tyrone Foster's sentence for killing Robert Ellis, he said there was no doubt that this event impacted far more people than were in the courtroom Tuesday. Kemalyan then sentenced Foster, 25, to 90 years to life in prison for the March 25, 2016 killing. That day, prosecutors said that Foster walked up to a crowded strip mall in the 5500 block of South Vermont Avenue and, aiming for rival gang members, opened fire into a crowd of people that included toddlers. Ellis was the only one injured. After police publicized a video taken from the scene of the shooting, a tip from the public helped detectives get closer to Foster, who was arrested on suspicion of murder within two months of the crime. On Dec. 14, 2017, after a weeks long trial, a jury found Foster guilty of first-degree murder and five counts of attempted murder with gang and gun allegations. For two years, Ellis braced the LA freeways to come downtown. She got to know the parking attendant down the street. She hardly missed a court date because she wanted people to know that her son’s life mattered. The month before, Ellis approached the courtroom podium with a floral binder in her hand. More than 1,000 days had passed since the afternoon her knees buckled in Target and she fell to the ground. “I struggle to find joy or real purpose without Robert,” she said through tears. She’s not the only one. It’s still hard for his friends and his family to talk about, including his sister and his father. “Robert had so much in life to look forward to,” she said. He may have been a late bloomer, but he was headed in the right direction and had dreams of starting a clothing line or becoming a barber. A video was shown in court, showing Robert laughing, smiling and dancing with his friends. His mother said she wanted the judge to hear Robert’s laugh. After the sentencing, Lenell went to visit Robert at Inglewood Park Cemetery. She brought flowers decorated with butterflies. Now, without any looming court dates, Ellis said she has to figure out what to do next. The sentencing didn’t change a thing, she said. Now the question is how to keep his memory alive. “My son is still gone,” she said. — Monica March 26, 2019 at 11:14 a.m.